Gamification is about motivating people through data. Although the definition isn’t perfect, Paharia introduces two important factors: motivation and data. Above all gamification is about how you can use game elements to affect people’s behavior. In other words, how you can motivate people to act according to the set goals. Data is needed because a) data is the only reliable source to find out what behaviors need to be changed to reach the goals and b) making data transparent is an effective way to motivate. Even the trending topics of biohacking and Quantified Self are based on the idea that you can develop your performance and increase motivation through data. At Cloudriven, we’ve divided the process of gamification into five different phases as presented in the above image. 1) Collect behavior data. Without sufficient data it’s practically impossible to decide which behaviors need to be changed to reach the set goals. In the worst case scenario the planned actions can lead the whole organizations to the wrong direction if the decisions are based purely on the intuition of management. The amount of data in organizations has multiplied during the last decade and many companies are desperately trying to figure out what to do with all the big data. But especially in situations where the collection of data depends on people’s own effort, data quality isn’t necessarily that good. For example, sales reports are reliable only if sales people conscientiously log their activities to the CRM system. If the sales representative feels that the task is not meaningful or she doesn’t have a sufficient incentive to perform, the task won’t be done and the sales report will be inaccurate. 2) Analyze the data and make conclusions. Yetthe mere collection of data is not enough. The data needs to be analyzed so that proposals for action can be given. Often data may be derived from multiple sources and it lacks structure. In this kind of situation data needs to be modified and transformed into commensurate and understandable form before making the actual analysis. The purpose of the analysis is to recognize the causes of your business challenges. It can for example examine why the sales performance is weak or why some units never reach their business goals. Behavior data arises from people’s actions and therefore it gives you an honest perception of the present state of your organization. 3) Design behaviors. Based on the analysis and conclusions a detailed management plan should be created. How are you planning to manage the behavior change in your organization? If the goal is, for example, to significantly increase sales activity during the next six months, management has to deconstruct the goal to weekly actions: 30 phone calls to prospects, 7 meetings, 50 e-mails, 2 deals. In addition you have to decide, how the sales actions are being monitored and what kind of encouragement and support the sales representatives need. 4) Choose the right tools. Change has to be supported with tools that encourage and lead the behaviors to the desired direction and at the same time make the monitoring easy and transparent. This is where the game elements come into play; game mechanics can be used to tap into people’s motivation factors. But you shouldn’t forget that gamification goes hand in hand with usability: it should always be clear for the user what she has to do next. In its most simplified form “gamification” can mean that the user is being guided to perform the right actions by using user interface elements and instant feedback. 5) Follow changes in behavior and collect data constantly. Change takes time and doesn’t happen in a day. 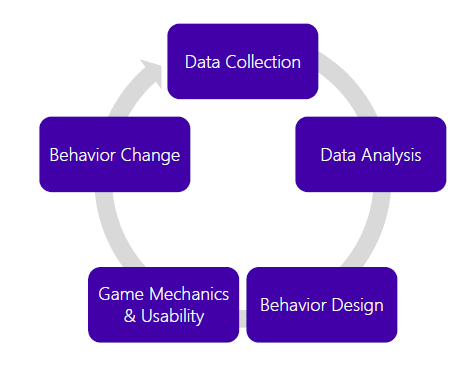 Changes in behavior have to be followed constantly and adjustments should be made to the game elements and other parts of the system based on the data.